A rough first-quarter report spooked investors last month. 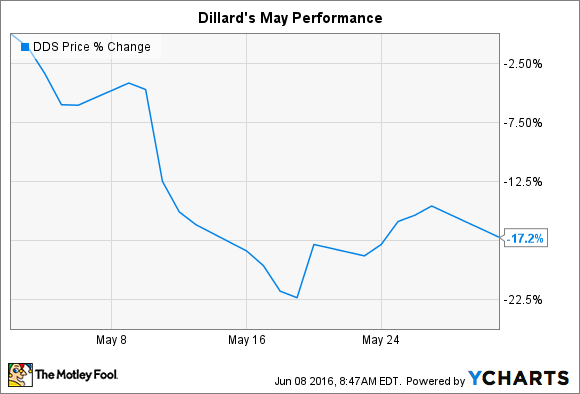 What: Apparel and accessories retailer Dillard's (NYSE:DDS) stock sank 17% in May, according to data provided by S&P Global Market Intelligence. The slump left shares down 40% in 2016 and at their lowest point since 2012. So what: Dillard's stock fell early in the month in anticipation of a rough first-quarter report. Peers like Macy's (NYSE:M) and Gap (NYSE:GPS) had already warned about a weakening sales environment in the industry while lowering their full-year growth estimates. Dillard's ended up posting similarly weak results. On May 16, the retailer announced Q1 comparable-store sales fell by 5% (equal to Gap's comps decline and slightly better than Macy's 6% drop). Like its rivals, Dillard's saw its profitability drop as it cut prices to keep inventory moving through the system. Gross margin ticked lower by a full percentage point. "Our disappointing sales pressured our gross margin and net income performance," CEO William Dillard said in a press release. DDS Gross Profit Margin (TTM) data by YCharts. Now what: The weak customer traffic trends threaten to continue pinching Dillard's financial results. Executives can cut costs on an absolute basis, as they did in Q1, but as long as revenue is declining, the retailer is likely to post a sharp drop in net income. 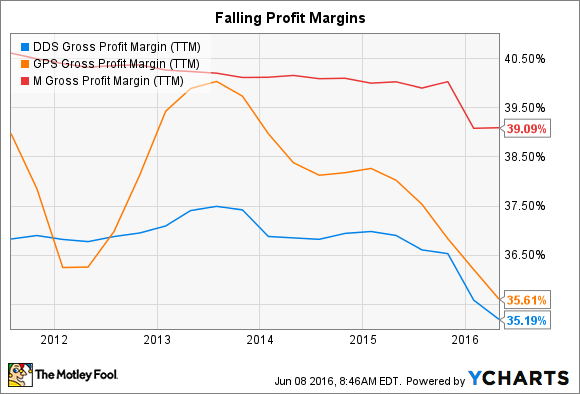 In fact, bottom-line profitability just fell to 5% of sales last quarter from 7% a year ago. Wall Street expects the pain to continue at least through the rest of this year. Consensus estimates peg full-year earnings at $5.92 per share, down 12% from 2015's result. Like other apparel retailers, Dillard's can boost results slightly through initiatives like improving its e-commerce infrastructure and prioritizing off-price locations. The company also continues to return plenty of cash to shareholders through stock repurchases. However, the stock isn't likely to break out of its historic slump until selling conditions improve in the apparel industry.